Interested in earning $1,000 per successful referral? Find out how with the Upside Partner Program - it’s free to join. Share the benefits of Upside Realty: a fixed fee, full-service real estate agency, helping residential sellers and investors maximise their return on investment. With the Upside partner program you can add a new, passive income stream to your business, and profit from unconverted and even unqualified prospects. Upside is disrupting the real estate industry with our combination of low fixed fee, technology-enabled, dedicated local agents. Your audience/clients can save thousands in fees if they sell their property through Upside! Add your partner link to your email signature. 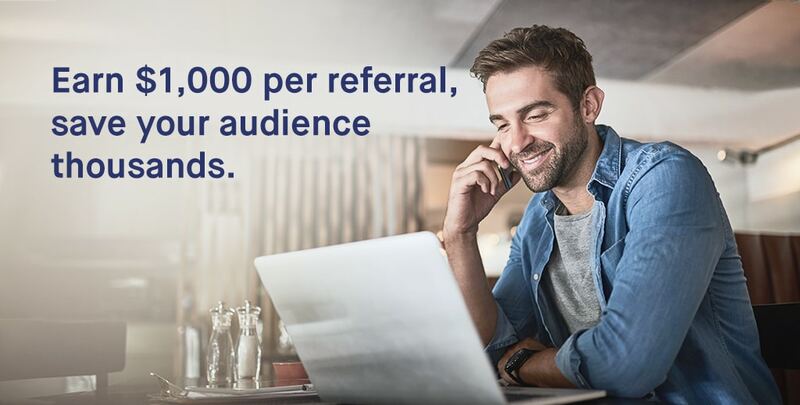 Once a successful referral moves into settlement, we’ll automatically trigger the payment to you - that's $1,000 per referral. The more you refer, the more you get paid. Refer 5 clients who reach settlement and you'll be paid $5,000. Refer 10 and it's $10,000. Refer 20 and we'll pay you $20,000. Our easy to use partner platform and real time tracking makes it easy to get all the information you need about your referrals. Since launch in September 2017 we've sold over 250 properties and saved Australian property sellers over $2.7 million in fees. Upside was established by industry experts to provide full 5-star Real Estate service for an affordable fixed fee. See how it works. Supported by smarter and simpler technology, our local agents work hard at getting the best possible price for every seller, every time. Vendors pay a $1,900 engagement fee (or $2,900 for auction), the balance is only paid upon settlement or deposit release.